Daydream II is a 300 Piece Jigsaw Puzzle designed by Alan Giana. Lush and colourful flowers surround this scenic beach. A beach chair stands alone in the sand, and a light house shines in the distance on this beautiful summer day. Available in two piece counts. Awaken III is a 300 large piece jigsaw is designed by Alan Giana. This puzzle depicts a still, colourful moment at a farm. White picket fences are lined with flowers and a sprinkle of birds find their place among the scene. Available in three piece counts. This 500-piece jigsaw is designed by Alan Giana and measures 45cm x 61cm. This puzzle depicts a still, colourful moment at a farm. White picket fences are lined with flowers and a sprinkle of birds find their place among the scene. Available in three piece counts. Guiding Lights is a 300 large piece jigsaw is designed by Alan Giana. This winter night is full of a variety of lights, be it from snow covered church, a guiding light house, or the sparkling stars in the sky. 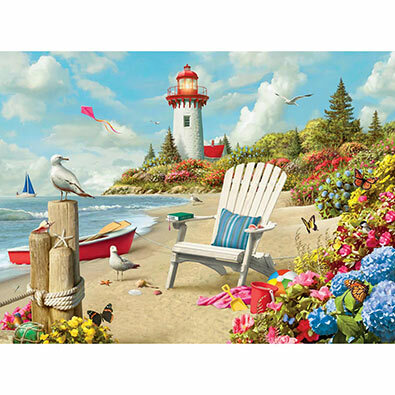 Daydream II is a 500 Piece Jigsaw Puzzle designed by Alan Giana. Lush and colourful flowers surround this scenic beach. A beach chair stands alone in the sand, and a light house shines in the distance on this beautiful summer day. Available in two piece counts.